The fourth annual Teens Lead Ahead (TLA) took place June 18-21 in Bethel. Organized by Teens Acting Against Violence (TAAV) in Bethel, the four day youth leadership camp focused on the theme, “Keep the Cycle Positive.” Drew Michael, the mask carver whose exhibit, Aggravated Organisms, was on display earlier this spring at the Cultural Center in Bethel, mentored the youth as they carved their own masks. Marie Alfred showed the teens how to create their own story knives. Keggulluk returned for a second year to talk about the importance of having a positive mindset, persistence, perception, piiaq, and making good choices. He also led the group in a yuraq. 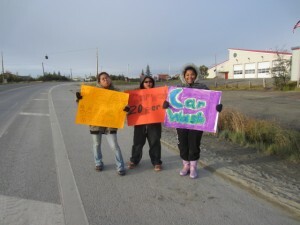 Teens Lead Ahead celebrates Yup’ik culture and traditions, local artisanship, and the power of youth from the Yukon Kuskokwim Delta to support each other in creating positive changes in this region. At fish camp, the youth did many subsistence activities including stripping bark off of trees to hang fish, catching fish, cutting fish, preparing ducks, gathering tundra for tundra tea, singing, dancing, making akutaq, and swimming. 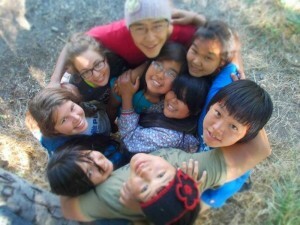 TAAV has welcomed youth from Napaskiak, Kotlik, Kwethluk, and Kipnuk to Teens Lead Ahead in the past. 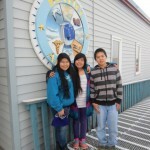 This year, youth from each of those villages returned, and for the first time, teens from Atmautluak, Hooper Bay, and Scammon Bay flew in for the camp. It was wonderful to have a greater representation of youth from throughout the Delta. Kuskokwim Wilderness Adventures for providing transportation, Mary Beaver for donating some ducks, Sam Chanar for his help at the dorms, Christina Polachi, Shannon Cogan, and James Wayne for their help in setting up, Nicotine Control, Elizabeth Roll, Tiffany Tony, Debbie Fairbanks, Swansons, AC, and Public Health for providing food. TAAV will be selling Krispy Kreme doughnuts during the month of April and the first week of May to raise money for its upcoming Outward Bound trip to Maine. The cost is $20 for a dozen doughnuts. 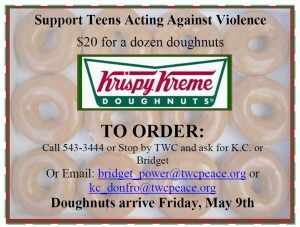 Talk to a TAAV member or call TWC at 543-3444 to pre-order your doughnuts. 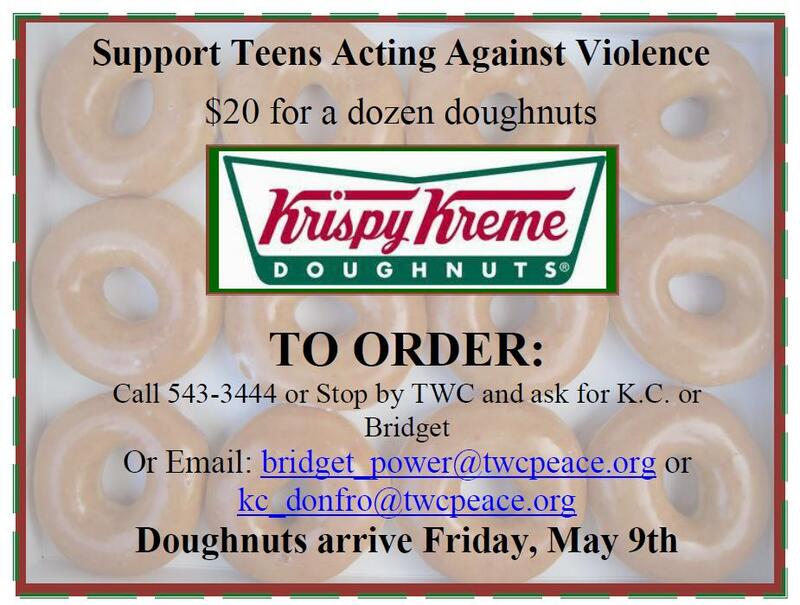 Doughnuts will be delivered on Friday, May 9. 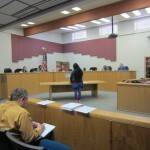 Several TAAV members attended yesterday’s Bethel City Council’s meeting. During the opportunity for public comment, they spoke about their experiences with TAAV and the importance of the annual Outward Bound trip. Hello my name is Elizabeth Andrew. I’m 17 years old. Outward Bound is a trip downstates where we do stuff outdoors. Last year we went to Oregon and we went whitewater rafting on the Deschutes River. We we did many things like rafting, swimming, and exciting things like jumping off rocks and swimming in fast water. We also got to learn new and different skills. It was a very fun and exciting experience. We want to go this year because it is in a Maine, a very new and different place. We are going to learn how to sail. We are very excited for this trip and have been planning and fundraising for this trip all year long. We need these miles because it is very far away and we need as much support as we can get. Thanks for considering giving to us. Hi my name is Austin Atcherian. I am 16 and I am in 10th grade. I have been in TAAV for about two years. During Outward Bound I learned about leadership and I want to go back because I want to learn more and more stuff and have fun at the same time. Thanks for considering donating to us. Last year I ventured on my first trip out of state and learned that there is more to life than your comfort zone. Sometimes you have to go out of your own circle and find out that there is more to life than your self and there are also more places to learn about and explore. I also learned that you have to work as a team in unison rather than doing your own thing. 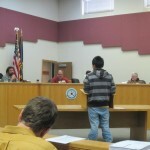 After hearing TAAV’s testimony, the Council decided to discuss AM 14-23, TAAV’s request for a donation of twenty thousand Alaska Airlines miles for its upcoming Outward Bound trip to Maine in late May. The Council voted 6-1 to donate air miles to TAAV. TAAV will be selling Krispy Kreme doughnuts during the month of November to raise money for next summer’s Outward Bound trip. Talk to a TAAV member or call TWC at 543-3444. We’ll also be at the Saturday Market on November 23 to take orders. 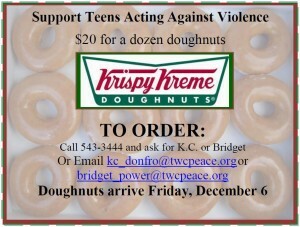 Doughnuts will be delivered on Friday, December 6. 16 TAAV members washed cars in the DMV parking lot on Saturday, September 21. The group raised over $700.00 for TAAV’s 2014 Outward Bound trip! Thank you to everyone in Bethel who stopped by and to the Fire Department for letting TAAV use its hoses. TAAVers Felix and Kenneth Bigjohn, TWC staff members, Matilda Bee, CJ Pleasant, Misti Nelson, Fr. 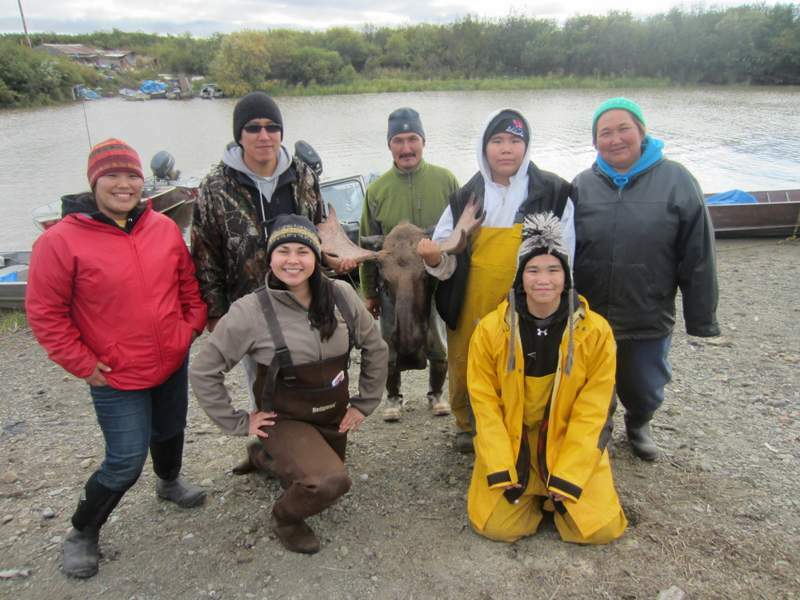 Ishmael Andrew, and Jackie Larson caught a moose not far from Napaskiak on Friday, September 13. TAAV was able to hunt this fall year using a cultural education permit from the Department of Fish and Game. The group spotted a large moose around 11 am before it disappeared into the woods. Jackie made a moose call, and two different moose appeared out of the brush. Jackie shot one of them, and the group brought the moose back to the TWC. Many thanks to everyone who helped carry, clean, and process the meat. The majority of the meat will be used by women and children in the shelter, but TAAV will also host a small feast for TAAVers and their families. In July seven TAAV members and the two TAAV coordinators traveled to central Oregon to participate in an Outward Bound five day white water rafting course. The group travelled down the Deschutes River learning rafting techniques, leave no trace camping skills, and valuable instruction in leadership, communication, and teamwork. TAAV members further challenged themselves by swimming through rapids and jumping off some 10 foot rocks. All the teens finished the course with a renewed sense of empowerment and commitment to their work in Bethel and TAAV. After Outward Bound the group also spent 3 days in Portland going swimming, shopping, and going to the movies! Outward Bound is one of the highlights of the TAAV program- for many it was their first time traveling down states and it was truly rewarding for all. Though TAAV members fundraise all year to fund Outward Bound, all of the flights were generously donated by community members! Thanks to all who support Teens Acting Against Violence! This June, Teens Acting Against Violence hosted its third annual Teens Lead Ahead Camp. Twenty eight youth from Kotlik, Napaskiak, Kipnuk, and Kwethluk along with twenty TAAV members gathered in Bethel for this 3 day event. 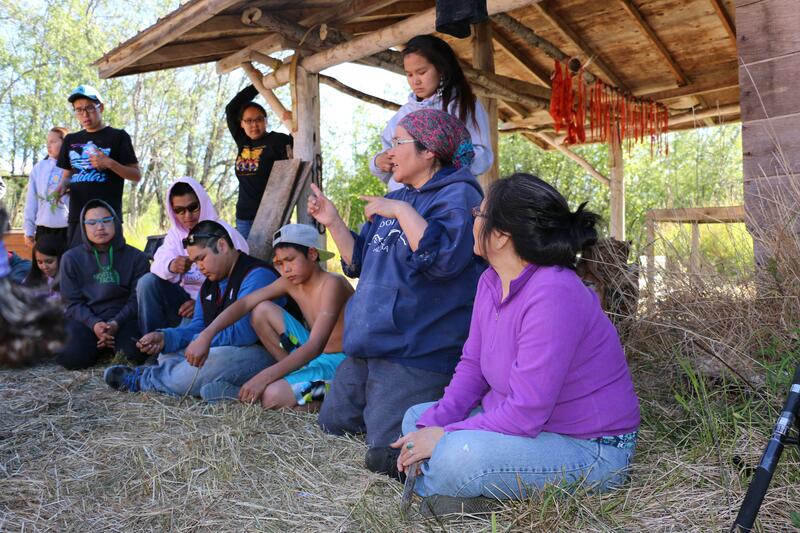 A highlight of the camp was the day spent at fish camp during which youth were able to participate in fishing, cutting fish, plucking birds, gathering wood, and making story knives. Rob Kinean, an Anchorage based chef who specializes in traditional foods spent time with the group, cooking a smelt salsa and a duck soup. Campers were also lead through a community planning activity by one of the Green Dot violence prevention facilitators. Keggulluk gave several presentations along with the Promoting Health Among Teens peer education group. Other highlights of the camp included a town wide scavenger hunt and a dance held at the teen center. Overall, the third year of the camp was a continued success and involved more youth leadership, including several TLA alumni serving as chaperones. Once again, this year’s TLA would not have been possible without the generous support from our partners- YKHC, AVCP, ONC, and LKSD, ANDVSA, TWC staff, and all of our community volunteers! Pictured are Youth Services Coordinator, Eileen Arnold, TAAV Coordinator Lou Vilardo, and TAAV member Megan Moses. 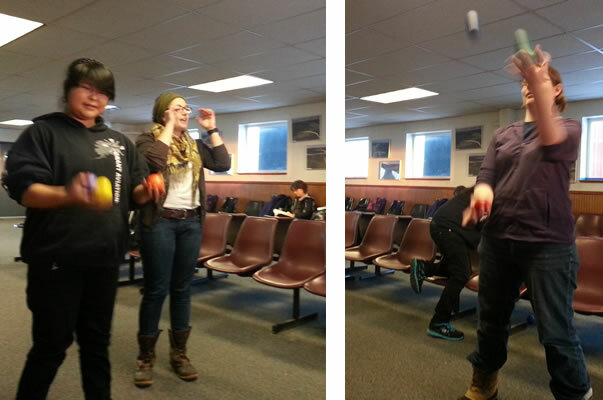 Lou is teaching Megan and Eileen how to juggle while we’re on weather hold, trying to get to Akiachak. As the winter school semester continues, TWC’s Youth Services staff is planning their semester of school travel. 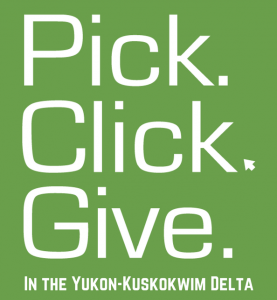 Every year, schools from various districts in the Yukon-Kuskokwim Delta request an opportunity to receive safety classes from Youth Services staff for all of their students. A safe/unsafe touch class for K-2 is offered, along with an anti-bullying class for older elementary students. For middle and high school, a teen dating violence clas/healthy relationships class is offered; peer taught by TWC’s TAAV members. 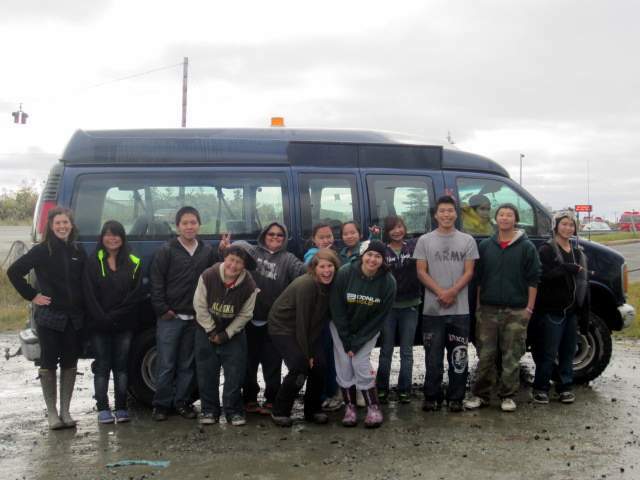 In the Fall 2012 semester we traveled to Napaskiak, Atmautluak, Unalakleet, Nunam Iqua, and Mountain Village. In February we traveled to Tuluksak for their educational summit and have plans to travel to Akiachak, and Goodnews Bay this semester as well. If people are interested in having staff come to your community school, please contact Eileen at TWC–543-3444. 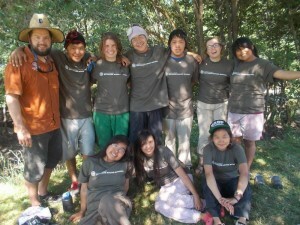 Teens Acting Against Violence (TAAV) has returned from yet another very successful Outward Bound trip this year! Outward Bound is an outdoor education program where professional staff guide wilderness expeditions designed at fostering personal growth, leadership, and teamwork. This year’s Outward Bound trip consisted of white-water rafting on the San Juan River in Utah. Six TAAV youth along with two chaperones embarked on a 5 day trip along the river. The teens learned different paddle strokes and how to coordinate and maneuver their raft, how to handle serious rapids, along with basic camping and survival skills. After Outward Bound the group spent two days in Denver which consisted of going out to eat, visiting a water park, seeing movies, and of course plenty of shopping! Over all the trip was a huge success and could not have been possible without the help and generosity of all those who made donations and gifted us miles. Quyana!